Have a book you're dying to share with the world? Sigil is an open source program available for free online that will allow you to quickly and easily convert your book to the .epub format for submission to Kindle ebooks and elsewhere. 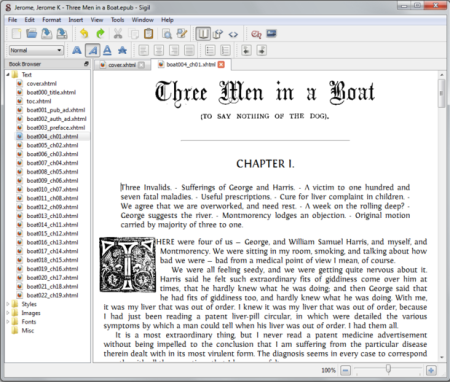 Publishing options for ebooks abound, but if you've honed in on the opportunity to self-publish your ebook with Amazon - for the Kindle - or elsewhere and need an .epub format file, you probably need some words of encouragement, a pat on the back for writing a worthy and unique book, and a little help converting your book to the proper format for publication. I'm here for ya! I'll walk you through the wonderful Sigil Program .epub formatting process. Alright, the first thing you're going to want to do is open your document in whatever program you've created it in and use the "Save As" feature to save the document as HTML. Then go online and grab the free Sigil program and install it on your computer. Open your .HTML document in Sigil and immediately use the "Save As" feature to save your document with an .epub extension (It's the only option available in the program.). Now you have a document that is in the correct file type for submission to Amazon's Kindle ebooks, but don't stop now; your book still needs to be properly formatted - this is where you're going to fall in love with Sigil! o If you observe the left column of your screen as you work you'll notice that each time you click on the Sigil squiggle a new file is created - pretty cool, huh? This is the feature you'll use to separate your cover page from your copyright page, dedication page, chapters, etc. It's fast and easy: place your cursor where you want a break and click the Sigil squiggle!